The semiconductors are the type of material which electrical property lies between conductor and insulator. 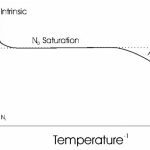 Semiconductors act like insulator at very low temperature, as the temperature increases conduction of semiconductor increases. Semiconductors in their natural state are poor conductors because a current requires a flow of electrons, and semiconductors have their valence bands filled, preventing the entry flow of new electrons. There are several develop techniques that allow semiconducting materials to behave like a conducting materials such as doping or gating. Semiconductors have negative temperature coefficient of resistance that is the resistance of a semiconductor decreases with the increase in temperature and vice versa. 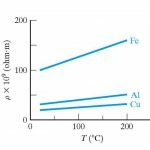 This happened because the number of charge carriers present in a semiconductor are less at low temperature, but highly dependent upon at high temperature just like germanium, silicon etc. are actually insulators at low temperature but they act as good conductors at a room temperature. The forbidden energy gap of semiconductor is 1 eV. Most common type of materials that are commercially used as semiconductors are germanium (Ge) and silicon (Si) because of their property to withstand high temperature.